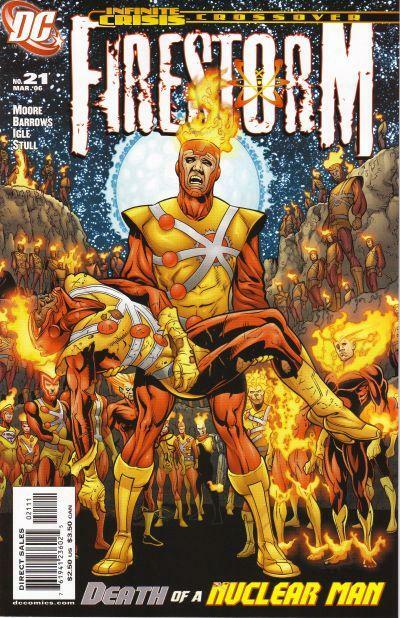 Remember from many of my previous entries that I'm a huge fan of Firestorm. 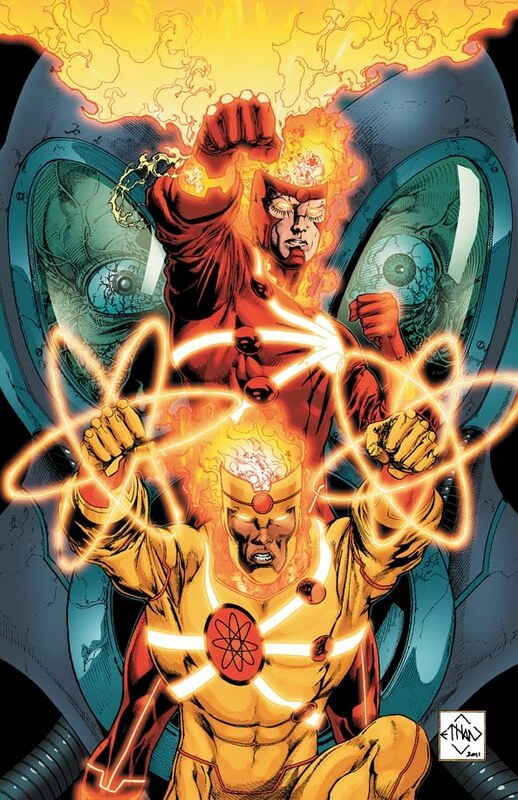 I came on board in the days when John Ostrander had just begun his tenure that would explore multiple permutations of what eventually was dubbed "the Firestorm matrix." I read all the back issues I could. After the key duo of student Ronald Raymond and Professor Martin Stein disbanded, the character floundered. 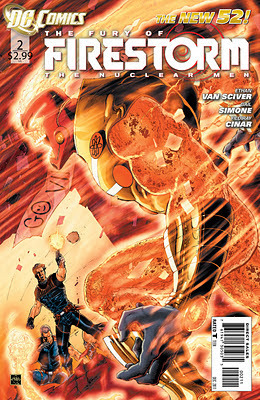 Then DC Comics launched a new series with a new Firestorm, a teen named Jason Rusch, in 2004. Unlike what they'd done with the character during the intervening years, this new Firestorm merged with other people just like in the old days. 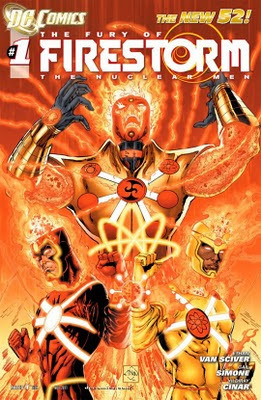 When Ronnie became part of the new Firestorm, I cheered even though it didn't last long. And when Martin Stein returned from the abyss to merge with Jason in a brand-new status quo--well, "squee" sums up my feelings, however inadequately. During the last year, Brightest Day returned the Firestorm character to prominence, with writers Geoff Johns and Peter Tomasi telling a story of how the complex relationship between Ron Raymond and Jason Rusch was causing the Firestorm matrix to grow increasingly unstable. Although Prof. Stein died in the series, the plot hit all the right notes, and at the series' end I was thrilled at the seeds planted for the launch of a brand-new series. It's just a shame that DC decided to go in a completely new direction with the new series, not picking up from Brightest Day but instead spinning out of the line-wide relaunch dubbed the "New 52." Now, what we readers are getting is what you could call "Ultimate Firestorm." Co-writers Ethan Van Sciver and Gail Simone have jettisoned the past, and everything old is new again. This time, we have Professor Stein (still dead?) bequeathing a cylinder representing "everything nuclear physics can be" to young Jason Rusch, a nerd with a chip on his shoulder who inexplicably finds himself and jock Ronnie Raymond transformed into superheroes with complementary yellow and red costumes when he, um, holds the cylinder and says the magic word really loud. And because it wouldn't be cool to have a nuclear hero out there without some shadowy terrorist organization chasing him/them, Van Sciver and Simone introduce Zither and her army of black ops assassins, including a reimagined Cliff Carmichael, formerly a fellow student of Ronnie's in the "Flash" Thompson bully mold, but now just another cold, calculating guy with a gun. They also have a special unit called Team Hyena, because in an age of super-science that's so much scarier than having a duo of were-hyenas like in the old Firestorm's rogues gallery. Immediately, having the teens in possession of a "rogue Firestorm Protocol" means bad news, like people with the authority to send the police to interrogate the families of Ronnie, Jason, and their friend Tonya. Jason says they can all never go home again, never be reunited with their families. With the previous era's Ron and Jason pretty much isolated from their loved ones, what was the advantage of relaunching with them as high school kids? Especially if they're not even going to keep them in high school? The new Firestorm is nothing like the original. In fact, it may be closer in tone and scope to the Ostrander series that first hooked me. So with that in mind you must be asking yourself: "Gary, if you were such a fan of that stuff, why don't you like this new stuff?" Where would you like me to begin? Say what you will about Ostrander's "blank slate" Firestorm with Ron and Russian Mikhail Arkadin trapped inside an amnesiac Firestorm. At least there, we had a human-looking, articulate protagonist whose identity actually ended up being meaningful in the larger scheme. This Firestorm is a rampaging engine of destruction and you better not let him out, ever ever ever or Hulk will smash puny humans. Oops, where was I? Also, well, this is supposed to be a relaunch, and that's all well and good. The unwritten rule is that, if you have a first issue, then at some point you should stop to explain your characters' abilities and other details. Apparently the new creators never got the memo, because already over the first two stories we're seeing the Firestorms using all kinds of powers, including transmutation and the like, as if they've known how to use these powers all their lives. No looks of shock on their faces when they do something they haven't been able to do before! Everyone's jaded, as unwilling to articulate about their powers as their writers. "I have new super powers! It must be Tuesday!" 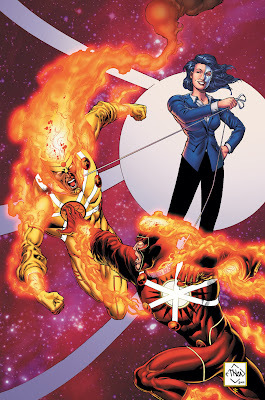 The biggest thing missing from the relaunched Firestorm is, simply, any sense of wonder or fun coming from the protagonists or any members of the supporting cast. From the first page where we see terrorists kill a family in Istanbul, the series is wholly about dire circumstances and the threat of death, either from the terrorists themselves or the nuclear threat of the mysterious "Firestorm Protocols." The terrorists have to round up the magnetic bottles, or life as we know it is doomed. And life is doomed because we've got Tonya having psychic visions about the end of the world. This attitude bleeds through to Ronnie and Jason. From the moment they meet, they're angry character archetypes, the angry nerd and the angry jock, and they hardly seem to be able to stop arguing long enough for Jason to engage in unintelligible, faux scientific jargon and Ronnie to tell him he doesn't understand a thing he's talking about. And then they get angry again, and sooner or later they're in their cute matching nuclear outfits with the puffy sleeves again. There's no sense of fun in their interactions like there was between Ronnie and the Professor, or Jason and the Professor, or even the Ronnie and Jason of more recent, pre-Flashpoint vintage. The problems with the new Firestorm are endemic. There's a vast, labyrinthine X-Files-lite conspiracy at the center of the story, with everyone mortally afraid of the unleashed power of the Higgs-Boson, the cliched and trite excuse at the center of this most recent origin of Firestorm. (Say what you will about the hoops Ostrander jumped through en route to making Firestorm a fire elemental; at least his logic leaps made a degree of sense.) Instead of one hero with another character providing the voice of wisdom in his head, we have two idiots who don't have a clue how to use their powers, led by an absentee mentor. And did I mention that when they get angry, they merge and become a bigger idiot over whom they retain little control? At New York Comic Con this year I had a talk with Brian Clevinger, co-creator of Atomic Robo, who was asked to pitch a Firestorm revival for the "New 52" that was stopped when DC decided to totally relaunch the character. I remembered reading his plans for a six-issue arc over at his website, and came by to tell him how highly I thought of his ideas and wished that his had been the story that made it to series. With one more issue released since then, my feelings have only intensified. His research into the series made it clear he cared about who these characters had been, pre-Flashpoint, and was going to build upon their recent characterization. It was also clear to me that Brian would have taken pains to make the book an easy read for new fans as well as old-timers (relatively speaking) like myself. If I had my way, I'd make up whatever feasible excuse I could to get Brian Clevinger aboard Firestorm posthaste. Were these two issues a fever dream like the eighth season of Dallas, or a part of some insidious master plan by a new villain? I don't know. 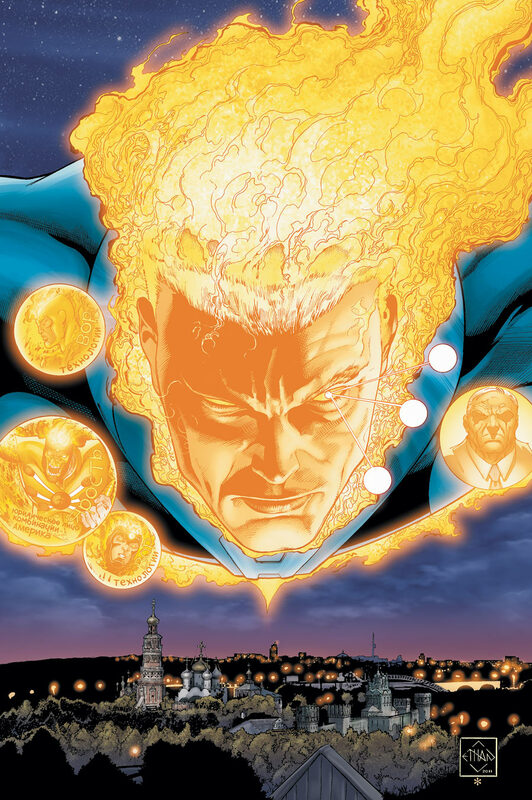 What I do know is that I'm incredibly disappointed by the lack of context, the lack of fun, the lack of everything I used to look to Firestorm for being. I don't want a hulking creature for a hero in Firestorm. I don't want a trigger-happy group of terrorists in Firestorm. I want crazy superheroics and escapism, not a book so overwrought with drama it makes me want to blow my own brains out when I reach the last page. Come on, DC. Bring back my Firestorm to me!